Am I Flippin’? Yes, I am! I am now a Flipboard enthusiast. This weekend, I found a new love. It has been under my nose for a long, long time. 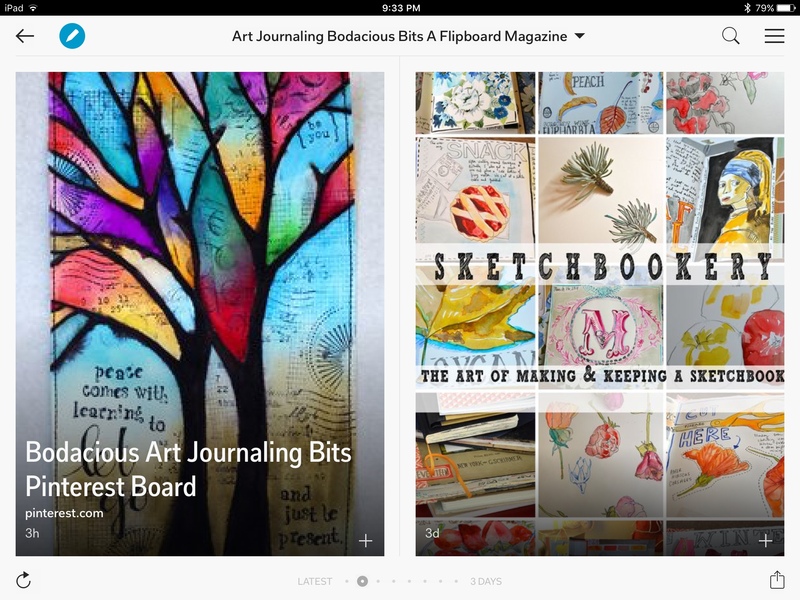 I am talking about the Flipboard app. I had tried it ages ago, I think on my Android tablet. I wanted a way to keep track of all my blogs. At that time there wasn’t very good instruction on how to add items other than the “choices” Flipboard gave you. I had fooled with this app for a couple of days and still couldn’t find a way to list all the blogs “I” wanted to follow. These days I have been mainly working on an IPad (although in ways I still miss my Android). Flipboard just came out with an update of their IPad app and I received some information about in in my email. The new version looked intriguing. I downloaded the IPad app and gave it a try. For some reason it doesn’t seem like I received the updated version. The layout doesn’t seem to match the video I watched of the new Flipboard version. I can’t say that whatever Flipboard version I have is so much easier to use than last time I tried it. I can say that just getting it to work on a few of my blog sites and a Tumbler feed had me seeing its awesome possibilities. And its awesomeness is all because of “flipage”. Being able to flip through your blogs to find something interesting is quick, easy, and what is more, it is very relaxing. Each item from your blog/feed comes up as an “article box”. Usually there are three to four article boxes on a two page spread. For me the coolest feature is that each article box has a photo identifier (if there is/are photo/s for the article). Its like an amazing picture book. An amazing picture book that you can fill with anything YOU want. To be honest, for me, figuring out how to add all the content I wanted to keep track of has been a challenge. Only because once I figured out how to add my blogs, I wanted my Youtube subscriptions, then my Tumbler feeds. Facebook, that would be excellent. What about Pinterest? If I could figure out how to add all these I could have one place to keep track of ALL of my interests. 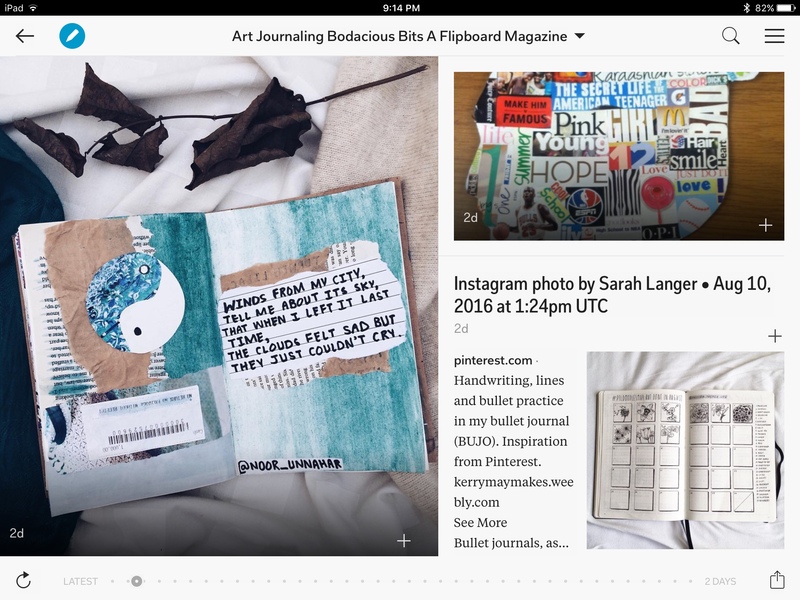 No more this app for blogs, Facebook for that, Pinterest, Tumbler, Twitter… On top of it all being able to “flip” through it to quickly look for anything that might spark my interest is just the best. But it gets better. I can make my own magazines on my own topics. Flipboard will add things it thinks I like. I can add things I like. Others can read/follow my magazine and add articles too. 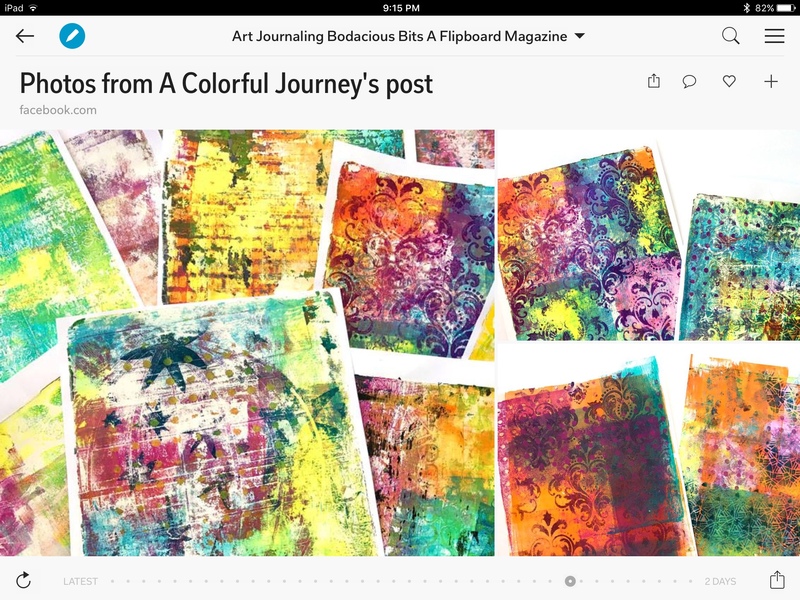 It is kind of what my hope was for this blog: a place to keep all my Art Journaling contacts and information; except it is visually stunning. And… so quick and easy to navigate. Just flip. Now I have a new routine for looking at any new information from by blogs, feeds, Youtube, Facebook … After work, when I am winding down and watching television, I often am not in the mood to really focus on new material… but it is a perfect time to look for interesting bits and flip it into one of my own magazines. When I have a bit of time when I can focus, read for a bit or watch a video I go to one of my magazines and flip through to find something interesting. As I flip through the magazine, I get to skim over what I have. So I get an idea of what is new. Then I can easily pick what I want to dig in to. This app really fanned the flame of my imagination. I actually spent many hours learning how to set things up and make my magazines. I had focus… I had desire. I actually wanted to blog again. So I could tell you about this. I feel like the wings I didn’t realize I still had, from lack of use, are unfurling. I am doing more and more… instead of sleeping. I anticipate what I will work on in the next day, instead of dread what may come. 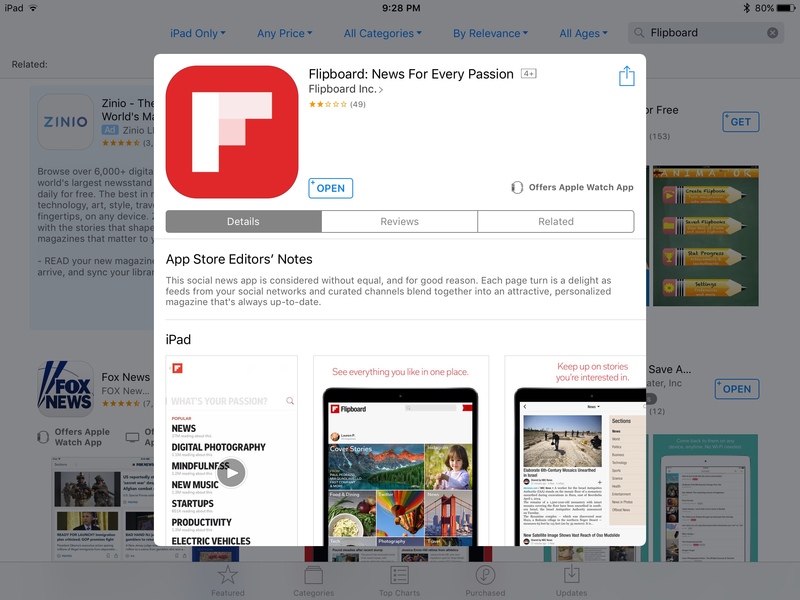 My hope is that if you have different internet sources that you like to keep track of that you will give Flipboard a try. 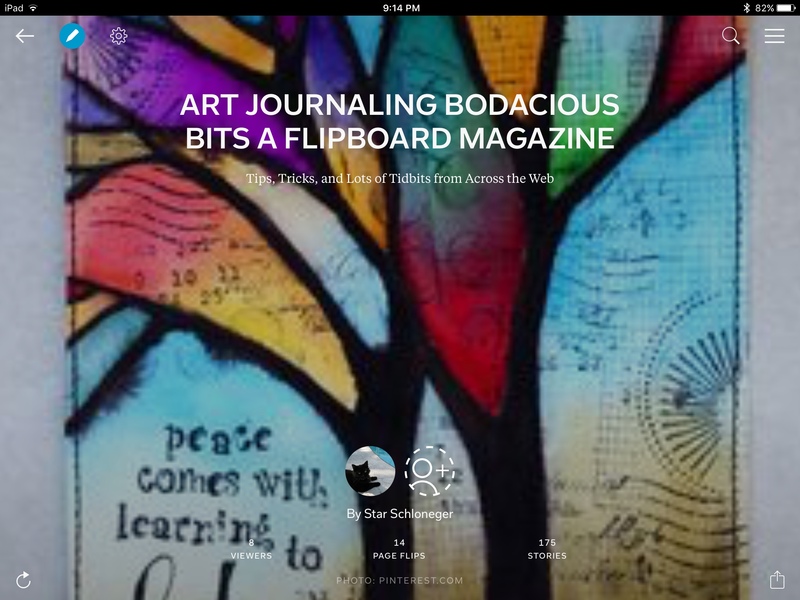 Also, if you are interested in a look, I have included the link to my Flipboard magazine, “Art Journaling Bodacious Bits…” My hope is that you will find it intriguing.I know that for me, I have to be mindful not to burn myself out. I haven’t felt like this in such a long time. I feel hopeful, energetic and inspired. Welcome to Spilling Life. I am so glad you are here! 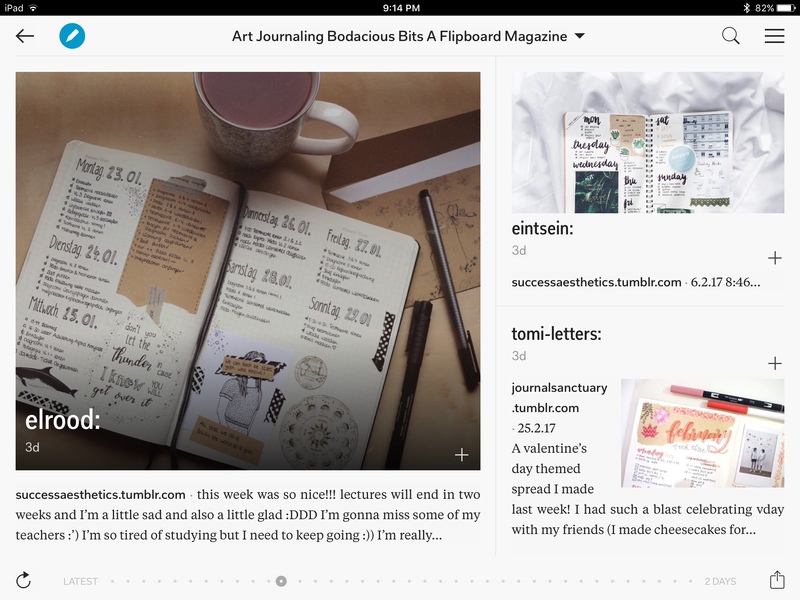 This blog is dedicated to everything journaling. Especially those practices that help you spill your life in a journal, on a canvas, on a napkin, on a blog, in a book...! I will make personal blog post discussing daily events and how they relate to my journaling practices and my life. I also want to make his a special place where you can find lists, reviews, suggestions on books, magazines and supplies, blog sites, and classes relating to journaling in all its many forms. My hope is to make this your go to place to find out about anything journaling related. I have included special pages of SOJOURNS, journaling exercises, for you to try out (They are listed right below this box, just click)! Please click on the comment button and ask questions, make comments and let me know how you are doing? Please, Please, Please, pardon my electronic dust. I am learing how to create this blog as I go. From day to day for the next couple of weeks, you might see a lot of changes, maybe a blank spot or two, maybe some leaness on content. I am in the process of trying to add photos, videos, lists, reviews, more posts and SOJOURNS. Some of these have been easier to add then others. So please stop by from time to time, to see what is new. Or you can follow this blog by clicking on the blue Word Press Follow Button just below this box and you will receive an email containing each new blog post so you never miss any goodies!